Even if Arturia’s BeatStep did nothing other than act as a dumb controller, it might get your attention. 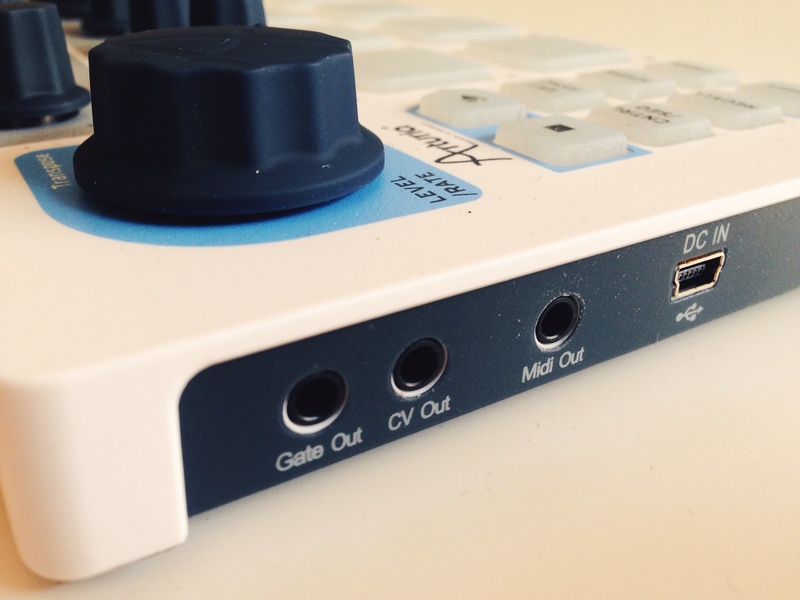 The compact control surface / sequencer hardware runs about $100 street. As a controller, it has both 16 pads and 16 endless encoders (with notches, so you can feel where you are), plus transport triggers and a larger encoder. With driverless USB operation, some of you will already be happy and can proceed. But the BeatStep is more ambitious than that. It has sophisticated software customization via a companion program, and a built-in step sequencer. It operates standalone, with MIDI gadgets or analog hardware (with gate and pitch Control Voltage outputs). It could therefore be a compact part of a mobile music-making rig, and it’s at this point that our review gets much more involved. The BeatStep has an impressive lineage – veteran designers Glen Darcey, Axel Hartmann, and Morgan Perrier collaborated on its creation. So there’s a reason to set expectations high. I’ve been testing the Arturia BeatStep with just those functions in mind. And we’ve collected some of your tips and questions, with information that might help you out whether you’re trying to decide whether to buy or curious just how deep this goes. 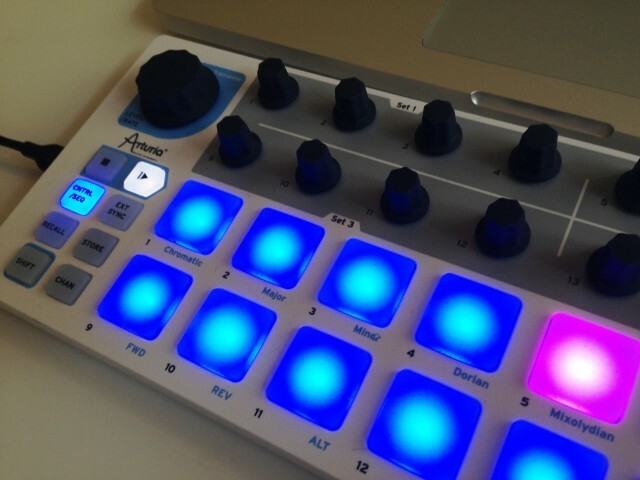 The BeatStep already makes a nice controller with pads and encoders. But how much more can it be? Let’s find out. Let’s start with the controller bit. The BeatStep is narrower than a 15″ MacBook Pro, as you can see in the photo, and roughly laptop thickness. It is, though, surprisingly weighty – in a good way. A metal base holds it firmly in place even if your finger drumming gets more intense. The pads feel reasonably good; they’re smallish but feel firm and velocity response (and continuous pressure) are consistent. The encoders are likewise satisfying, with basic soft-touch caps. I’ve already taken mine on the road and it appears to hold up well; my only gripe is some sharper edges round the base, but that’s minor. All in all, this is already no contest: this feels better than any comparable controller at this price. That said, even as a controller, you’ll immediately notice the absence of a display. While it keeps the unit small and inexpensive, this means you have no idea where you are on those endless encoders; there’s simply no visual feedback to speak of. Custom CC mappings. Of course. Nicely, they’ve also included standard MIDI descriptions. Knob acceleration. Fast, medium, or off (“slow”). Pad velocity curves. Linear, Logarithmic, Exponential, or “Full”. Templates. There’s preset save/recall, too, for all your templates, with up to 16 slots. You can even set custom MIDI messages to the Play and Stop buttons, for various kinds of transport control or using them simply as MIDI Control Change triggers. There’s very little you can’t do from software. The exceptions: LED function (red, blue, or mixed for purple) is fixed on the unit. And the six control buttons on the left are necessarily non-assignable. Everything else, though, is up for grabs, in a seriously sophisticated piece of controller software the BeatStep shares with the rest of the Arturia family. And it has to be the nicest piece of controller software I’ve seen. Heck, there’s even a detailed MIDI message console. 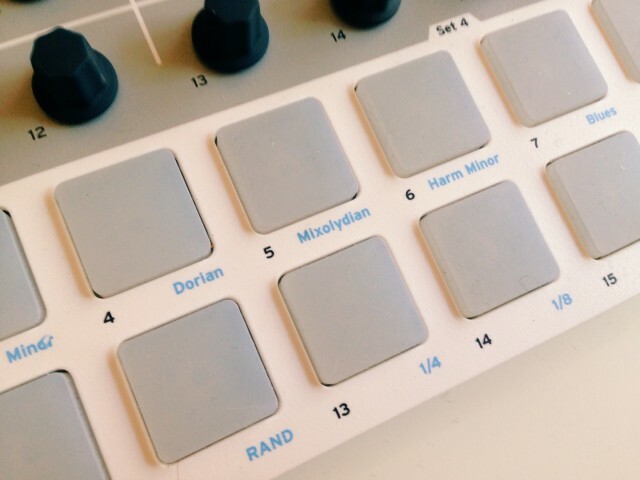 In controller mode, thanks to the scale controls, the BeatStep is also a reasonable melodic input device in a pinch – though, of course, 2×8 pads is not the optimal configuration for that job with devices like Ableton Push on the market. (And, you know, keyboards.) It’s nice having the option, though, and more on those scales in a moment. Ins and outs: you get 3.5 mm (minijack) MIDI output – the breakout to standard MIDI DIN is included right in the box – plus 3.5mm jacks for CV and gate output. Now, on to the fun part — yes, the BeatStep can work as a step sequencer. Modes. The BeatStep has independent modes for its two features. In CNTRL mode, it’s a controller. In SEQ mode, it’s a step sequencer. That allows you to use these two modes as independent layers of functionality, and there’s helpful feedback to let you know where you are. In controller mode, everything lights blue; in SEQ mode, pads are red when you tap them and the active step is blue. Those lights are bright, so you may feel a little bit like you’re playing from the hood of a State Trooper’s car (shame there’s no brightness adjustment), but you can at least stay oriented. Pitch. By default, each encoder is set to adjust pitch chromatically. The large Transpose encoder changes the pitch of the entire sequence overall. Now, because you can also set modes like major, minor, Blues, and User, you can more easily dial in the notes you want – nice. Pattern direction. Nothing too fancy here, but you can play patterns forward, backward, randomize the steps, or “alternate” (forward, then backward – basically ping-pong). On-the-fly pattern storage and recall. Does what it says on the tin: save up to 16 presets, recall up to 16 presets. Where this gets interesting is again in the software. The editor displays musical notation for each pattern. That means you can get really fussy programming your patterns before a gig, and have them ready to go. Pattern length, step length, and a really, really huge caveat. You can also change the step length (thus speeding up the pattern), by 1/4, 1/8, 1/16, 1/32, or by holding down SHIFT, change the pattern length to less than 16 steps for some syncopation. The caveat is, with the current firmware, a pattern immediately retriggers the moment you touch any of these controls, when you touch them. So, while the pattern still clocks to the tempo of an external source, you’re now very much not in sync on a downbeat. Arturia acknowledged this issue to CDM, and suggests it should be addressed in a firmware update. For now, I’d say this is a deal-killer for certain applications. Using it was exciting – enough so that I’m saving this firmware dump in case Arturia does ever fix it. You can play elaborate syncopations live. It’s just a little too exciting: there’s a reason step sequencers of this kind normally have at least a mode that syncs either to the downbeat or at least the active step size. The BeatStep right now does neither of those, clocking patterns free and potentially causing rhythmic train wrecks. The one fix, oddly, is recalling a pattern; that starts the pattern on the beat again. I’ll be watching for that firmware update. Swing. Swing is another major oversight – which also makes the BeatStep feel more like a software product rather than hardware product. Swing can be set per-sequence, but not on the hardware. You have to launch the editor and adjust it; it’s non real-time. The BeatStep is a whole lot of fun. As a controller, I wouldn’t hesitate to recommend it. You simply can’t get better editing functions or controller feel at this price. 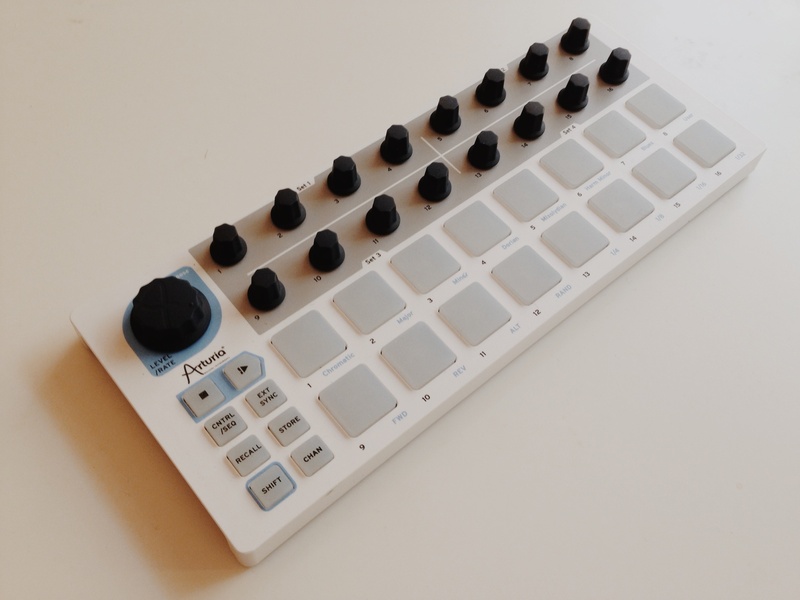 And honestly, having been attracted to the BeatStep for its control layout and standalone sequencer functions, I’m forced to take a second look at Arturia’s whole control range; it’s that good. Getting a sequencer, standalone operation, MIDI, and CV in the deal means it is going to be a must-buy for a lot of people. The problem is, that sequencer experience is still incomplete. You get 16 steps: no more, no chaining, no “B” sequence. Arturia even pitches this as a companion to the iPad, but the iPad has easily half a dozen step sequencers that best this one. And the issue with being unable to change step or pattern length easily is a big minus. Add to that the inability to set swing from the main panel, and this feels like it just isn’t a fully-formed sequencer. It’s a nice extra on a fantastic controller, but not the standalone sequencer some of us hoped for. I expect some of this to be improved in a firmware update. But the other issue is, simply, Arturia has created a very compact controller and there just isn’t room for more functionality. An LED would make programming easier; more controls would let you perform other functions or chain together more than 16 steps. For now, I’m willing to make those tradeoffs on the BeatStep because it is so inexpensive and light. And it’s not that I wouldn’t use this as a step sequencer – I continue to do that. The powerful editor and notation view mean that you can load up 16 sequences and carry them with you, and the combination of encoders with scale modes is great. But Arturia, a BeatStep Pro seems a logical next step. And in the meantime, I’m keeping my eyes out for a standalone device that operates together with a computer. While it has an ugly, shiny-silver faceplate, the M-Audio Trigger Finger Pro has all the layers, extra steps, visual feedback, and spacious pad and control layout that the BeatStep lacks – and it will operate standalone, too. The BeatStep has made me oddly more hungry for this kind of hybrid device, so I look forward to InMusic shipping that. As for the BeatStep: I can’t say no to this one. Even with its drawbacks, it’s easily become an essential piece of gear. So – on to the tips. Hack: SpeedDialer. Now, I like slowly turning through values, but apparently not everyone does. From maxforlive.com, a Max patch that addresses that. Also, I expect more M4L goodness once this device gets in more hands. 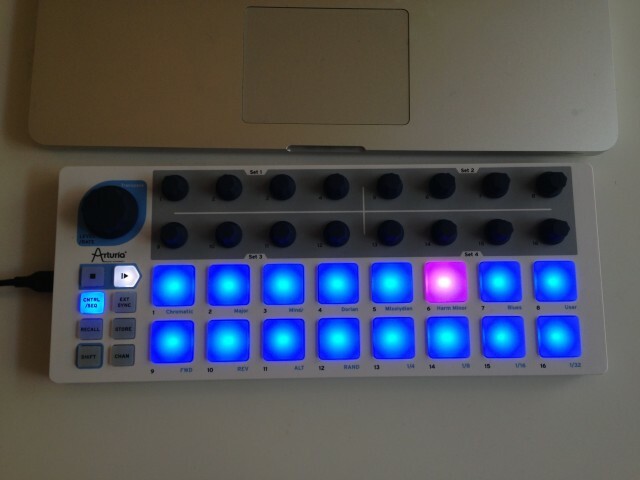 The Arturia Beatstep is a great device, but with its current firmware the encoders are much too slow. It takes 5 turnes to get thru all 128 values. I made this speeddialer to make fast movements possible. Just give a speedfactor (around 5 is good for me). You see two dials – the small one shows the real value, the second, bigger one shows the multiplied value which can be mapped to any function within Ableton Live. The values are interpolated with a ramp, so you should not hear any glitches. Source Distribution has a great interview with Glen about the hardware’s creation, as well as a nice Jupiter demo with a plug-in. There’s not a lot to say about analog operation – this is straightforward output of gate and pitch – but here’s the basic picture. Now, if that isn’t what your gear is expecting, there are ways of converting. 1. Pitch, as played from the pads. 2. Sequencer information, as recalled from the step sequencer. 3. Any output from your computer – meaning, like the also-very-useful QuNexus, the BeatStep is a quick-and-dirty MIDI-to-CV converter for your computer. Also of note, you can set the CV output to go with one of your 16 presets or to “global.” That way, you can always send CV (regardless of which MIDI channel is selected), or only when you specify. I love the BeatStep on the road. 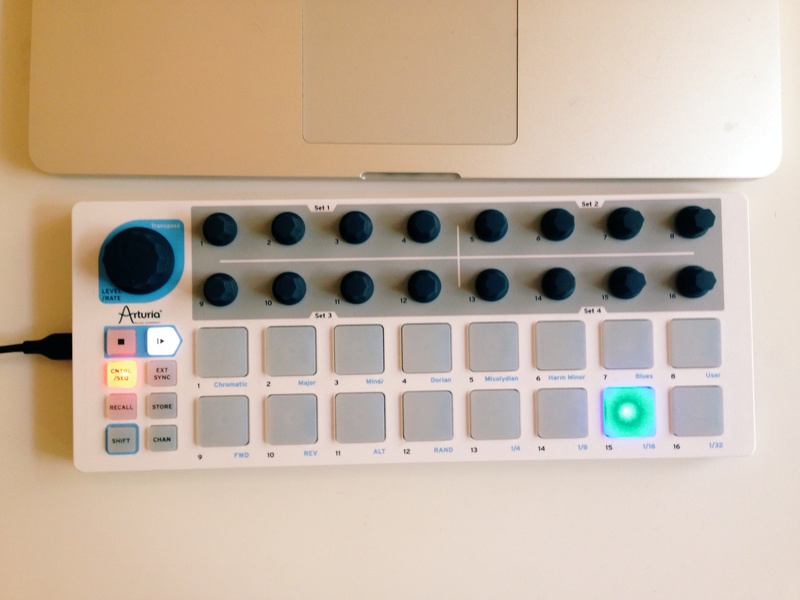 I threw one in my suitcase and connected it to my MeeBlip anode, clocking from Ableton Live (which also clocked a KORG volca beats drum machine and Native Instruments Maschine). So, all the melodic synth patterns you hear here (and some less-melodic patterns) are the BeatStep driving the MeeBlip, from a set I did recently in an underground club in Belgrade.